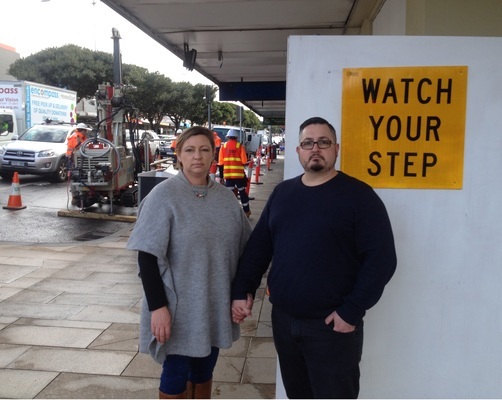 Geelong couple Melinda Phillips and Angelo Fusella are among multiple business owners forced to pick up the pieces since Belcher’s Corner building was shut down in July due to structural damage. The local couple face a unique double whammy by operating two different businesses at the same site. Together they invested their super fund and life savings into buying Angelo’s small 25sqm office outright in December 2016, to base his tax agent and accountancy firm AFTAX in the city’s centre. Melinda was also leasing retail premises in the building for her skin clinic Invoque. She said that when evacuation orders were issued overnight, all access to her business files and expensive equipment, including newly delivered skin needling treatment gear was suddenly blocked. “It’s been devastating. I couldn’t work at all for a month,” Melinda said. “I was forced to cancel all my clients’ appointments at short notice and couldn’t access any of my equipment or files until recently. Angelo estimates the couple has already clocked up $20,000 losses in operating costs and lost income so far, including “massive” relocation costs, with two lots of new bond and rental payments. “We’re in the tricky situation of operating two small business and our combined family income being tied to one building,” Angelo said. Tapping his networks including the Geelong Business Club and Geelong Chamber of Commerce members who shared their local knowledge and contacts, Angelo managed to secure temporary premises elsewhere. He is hoping to lock in a more permanent solution. Melinda has secured a new outlet in Gheringhap Street to start up again next week. However she says the shop fit-out, signage, printing, and other marketing costs will hurt. “We are now in recovery mode but as a family we also have school fees, birthdays and Christmas coming up,” she said. So far there has been no financial assistance provided to owners after the enforced shutdown. Angelo said he has made approaches to the Council via the Chamber about interest free loans available from local or state government in the circumstances but got a flat “no”. Mel has had a small win when the City agreed to waive a transfer fee for her health permit to new premises. Council says it is “not in a position to provide direct funding to individual business owners” but is “working hard to ensure the support it provides is tailored to best meet their individual needs”. A meeting of the Body Corporate committee today is expected to discuss mounting costs including emergency services bills and the future of the Belcher’s Corner building structure.